The AG-MSU10 Mobile Storage Unit has a P2 card slot and an interface box for a solid-state drive (SSD)*1 that will hold up to 2 TB (terabytes) of data. In addition to its compact, lightweight, rugged design, it features batterypowered operation for versatile field use. 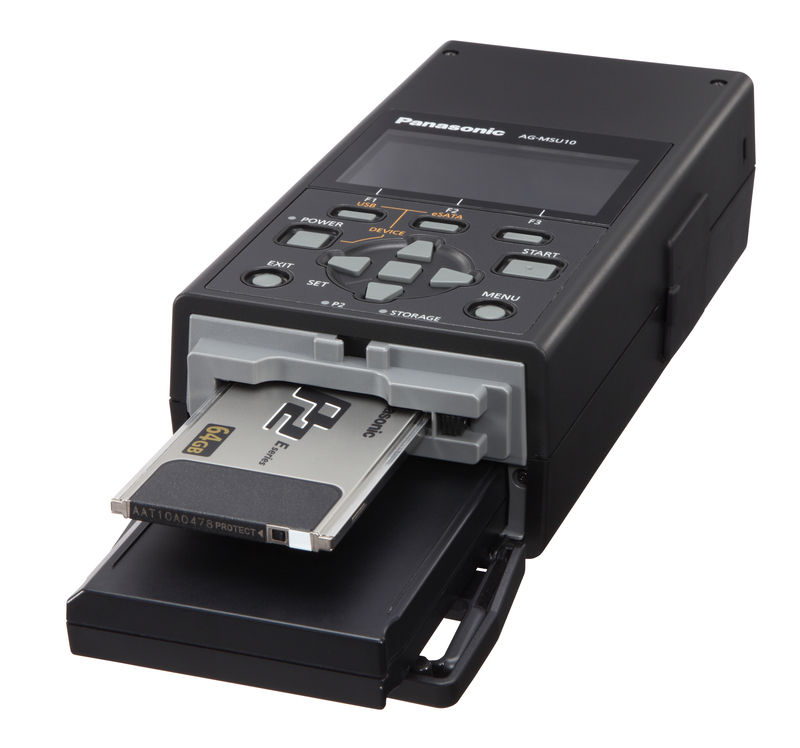 Files recorded onto a P2 card can be copied onto an SSD at about 4x normal speed for AVC-Intra 100 contents. *2 It has both eSATA and USB 2.0 connectors, so files can be easily transferred by connecting the AG-MSU10 to an external HDD or PC /Mac. Uploading to a backup or nonlinear editing system is fast and easy as well. The removable SSD interface box is also equipped with eSATA and USB 2.0 connectors, so it can be removed from the AG-MSU10 and connected directly to a PC/Mac. Special attention to field-based operation is further seen in features like one-button copying, a clip thumbnail display on the built-in LCD, and clip-by-clip copying. The AG-MSU10 contributes to comfortable file-based P2HD production by increasing speed, efficiency and reliability. *1: Use a commercially available removable SSD recommended by Panasonic. In addition to the removable SSD interface box that comes with the AG-MSU10 as a standard accessory, an additional AG-MBX10 can be purchased as an option. *2: File transfer speed varies depending on the SSD and external HDD writing speed, transferred files, P2 card version, and other conditions. Without verification.